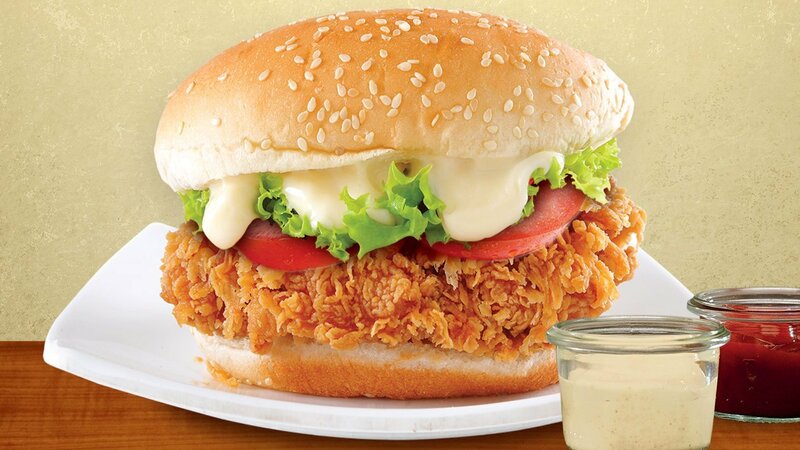 This burger consists of a super crispy & flakey chicken patty made out of the special blend of Knorr Coating Mix top with Hellmann's Classic Mayonnaise brings it all together. Try out the full recipe below! Mix Knorr Spicy Marinade (20g) powder, chilli powder, water and chicken together and marinade for one hour and more in a refrigerator. Mix Knorr Coating Base powder (80g) and wheat flour together and sieved twice to a tray. Then shake off any excess flour and dip the chicken pieces in cold water for ten seconds. Again, coat the chicken in dry flour mix and fold for another few minutes and fry till golden brown in pre-heated oil at 180 degrees. Meanwhile cut and grill the hamburger buns until golden. Top the bottom halves with the Hellmann’s Classic Mayonnaise, iceberg, fried chicken, tomato, tomato sauce, Hellmann’s Classic Mayonnaise and cover with the hamburger bun tops. Served with fries or salad of your choice.